The band of brothers battalion is getting cut as part of the army's draw down. See the Fox News article. I have started a petition on Whitehouse.gov to save it. Please sign it and share it. Thank you. So because somebody did a fictionalised TV series about it's forever sacrosanct? Thank God that never happened with the Walmington-on-Sea Home Guard. Piper, Up Spirits! Walmington-on-Sea, May those fearless men remain forever in the mind of Man. As for the U.S. Unit, these are rotated in, and out of active status from time to time, nothing new about that. normally, they just perform a Unit redesignation, and the same people get a new set of Crests, and the Unit file goes into the same inactive cabinet as in a Reduction in Force. Last edited by tankgeezer; 07-01-2013 at 07:07 PM. Well, didn't this troop help save the prestigious organization in which you find yourself a part of? Just don't give them a sticky Bomb. Hell no, my (former) lot got insta-mobilised in 1939 and sent to France while the regulars took the slow boat back from India. Having said that, the actual (as opposed to fictional) Home Guard were pretty good - or at least much better than their reputation. A rough analogue would be to recall US Marines/Airbourne troops who served in the 1990 gulf war and tell them they were about to be invaded by the Iraqis. The BEF of 1918 was by far the most capable army the world had ever seen in absolute terms, and the Home Guard were highly motivated, not all that old and generally in manual jobs so fairly fit. The Home Guard were certainly higly motivated, and were not quite so decrepit as "Dad's Army" might suggest. Many of them were out of the Forces because they were just a little over or under age, or in reserved occupations. Weapons would, however, have been a problem. At the time of greatest danger of German invasion (July-November, 1940), the LDF was well short of having enough rifles to go around. As for heavier/more advanced weaponry, they were largely thrown back on Churchill's "specials", most of which were high on the scale of weapons more dangerous to use than to encounter. The simplest example was the "sticky bomb" antitank grenade; apart from the danger involved in sneaking up on a panzer and attaching it to the tank was the danger of ending up with a live sticky grenade stuck to your uniform. Then there was the Smith Gun (described by one expert as highly likely to kill its own crew), the Blacker Bombard (the PIAT's big brother, suicidal to employ at its effective range against a half-competent enemy), the Northover Projector (with its unreliable grenades, and ignition system dependent on a black powder cap - in the damp English climate) ... and so on. Most of these weapons were used little or not at all by the Army, and for good reason. As regards the quality of British troops - as in WW1, the professional British Army probably had the best troops available to the Allies in the 1940 campaign (as shown by their performance in the later stages of the campaign), but they were few in number compared to the large French standiing conscript army. For this reason, the fact that so many BEF troops were rescued at Dunkirk must have been an essential condition of enabling Britain to fight on and to construct an effective wartime conscript army of its own. Not that the French were bad; again, in the later stages, first and second line French units - and even punishment (convict) units - often fought fiercely, helping, among other things, to allow the Dunkirk evacuation to proceed. Like the British, their French comrades were given little chance of stopping the Germans, giving the deficiency of the strategy and tactics insisted upon by the sclerotic French high command (who called the shots in their own country), and the deficiencies in the military communications and intelligence systems of the French army at the time. Best regards, JR. Indeed. They weren't alone in that though - their Japanese equivalents were to be armed with bamboo spears. The desperation weapons were pretty short-lived too though - and largely a function of how fast they were growing. They had ~1,000,000 firearms by late 1940 - not bad for a force conceived 6 months previously. The armaments problem arose because ~1,600,000 volunteers had joined. Remember also that the regular army was also expanding fast at this point. Thinking about it, it would be illuminating to compare the rate of growth of the Home Guard to that of the US Army in the same time period. I would not be surprised to find the former growing faster. It was my understanding from my consent to be included in this group photograph of the mods at their most recent 'knees up' that the photograph would not be seen by lesser mortals. Can't point to sources as this is from my imperfect memory, but my recollection is that the Home Guard was a pretty ordinary outfit in training and competence in its very early phases for pretty obvious reasons due to being cobbled together on the run, but by the time things got serious so far as an invasion of Britain was concerned, which was around the Battle of Britain, it was heading towards being a useful force and that this improvement strengthened after that period. Just noticed on basic webbing. Dad's Army was WWII, so post 1937. The pouches and maybe the basic webbing they're wearing is not 37 pattern, or at least not the 1937 webbing my generous government issued me around 1970. Is it WWI webbing, 1937 pattern, or something else limited or issued to the Home Guard in a transition to 37 pattern? 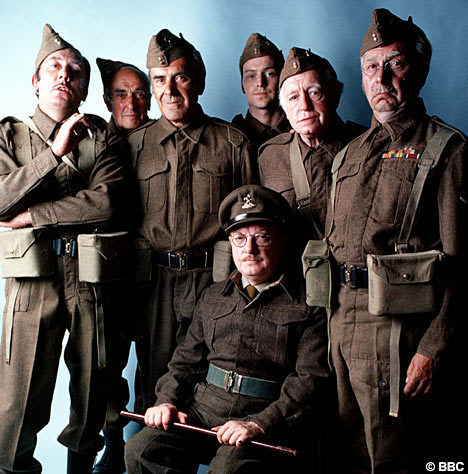 Also, just to be even more picky, Captain Mainwaring (aka Nickdfresh in the mod 'knees up' group photo ) is wearing a belt tending towards blancoed jungle green while others are wearing black belts which don't agree with their webbing. Last edited by Rising Sun*; 07-02-2013 at 09:35 AM. Problem in the Costume Department ? Mind you, from what one hears of the current state of the BBC, it is probably as well that nobody is proposing a remake. They would probably find themselves wearing the Close Combat Clasp and the Order of the Rising Sun ... JR.
As regards the restructuring/downsizing/renaming of historic units - nothing at all unusual in this. In the US Military, the "Fighting 69th"/165 Infantry Regiment of Civil War and subsequent fame has undergone a bewildering succession of reclassifications, upgrades, downgrades and reclassifications over the years, depending on the requirements of the moment. In the British Army, the practice of downgrading, reclassifying and amalgamating historic regiments has been in place for many years; another major round of "economies", to result in a further round of such changes, is under way at the moment. At least, I suppose, the Brits try to preserve the names of historic units, where possible. The truthis that, in the light of the needs of the moment, there is little space for sentiment in such matters. Best regards, JR.